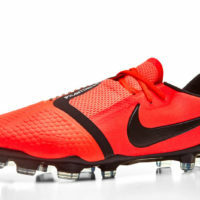 There are only a handful of instantly recognizable colors/finishes in the world of soccer cleats. Nike’s “Volt” and adidas labeling everything as “Solar (insert color here)” now feels almost as commonplace as bladed studs. However, in true Mad Max fashion, Nike is bringing their silos pasted in “Liquid Chrome.” While adidas might have beaten them to the punch with the Eskolaite Pack, there is definitely something iconic with Nike’s newest foursome. 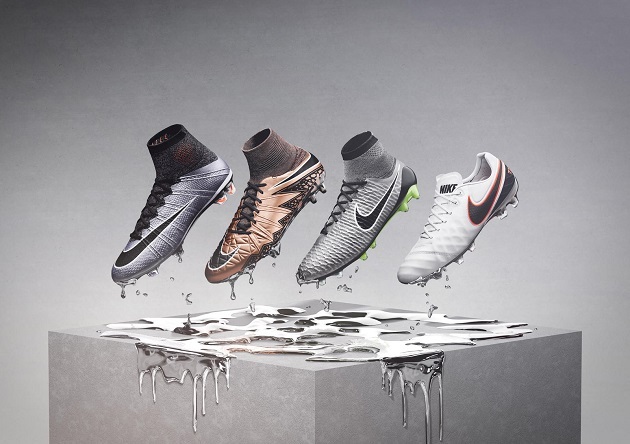 Chrome is not something that is new to the Swoosh, and all of these new boots feel like a serious nod to iconic boots of the past while still being so flashy that they could only have been produced in the modern age. 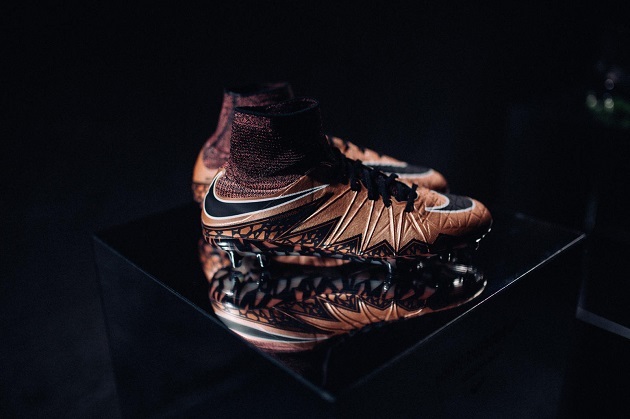 For the newest HyperVenom, we see boot dipped in a very bold bronze and black colorway. For any long follower of boots or Nike, this is a definite nod to the old Mercurial Match R9. The only real departure from the classic Mercurial are some slight hints of “mint” spread sparsely around the boot. 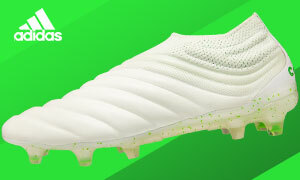 The HyperVenom II has been very well received (check out our review), and, despite a host of professionals seeking asylum in other silos recently, this newest colorway only continues to show the aggressive mindset that the Venom brings along with it. 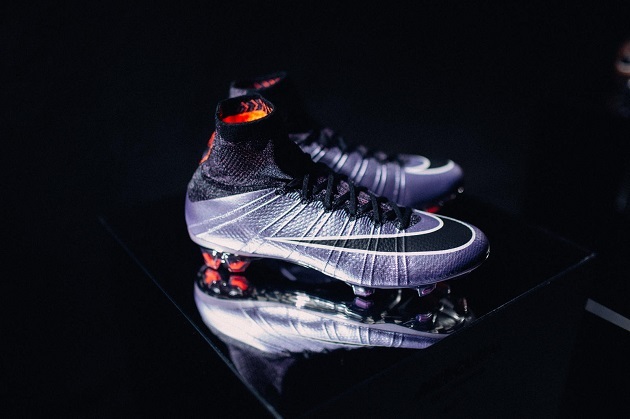 With the SuperFly IV, the “purple lilac” and orange studs feel like a direct homage to a host of SuperFly boots that we have encountered in the past. With the SuperFly 1, 2, and 3, we saw major colorway updates that used a predominantly purple look that the newest SF definitely takes to another level. With some serious sheen on the upper, we can’t wait to see what this looks like under floodlights and, much like the entirety of the pack, we expect these boots to simply leap off of the pitch and screen. The orange studs give a stark contrast to the “lilac,” while also bringing back memories of some of our favorite Mercurial boots of yesteryear. Nike definitely went brash with these boots, but still managed to bring their iconic history along for the ride. 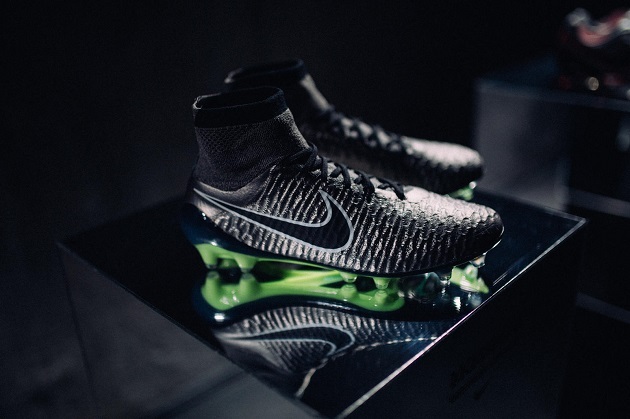 In the control silo of the Magista, we see the closest thing to standard chrome in Nike’s “metallic pewter.” Not my favorite colorway title as pewter is an inherently dull and weak metal, but, hey, it’s not my call. With almost scary likeness, the “Liquid Chrome” Magista bears a startling resemblence to one of the most legendary boots in all of soccer: the R9 Vapor I in chrome/lime. While Nike hasn’t really made a big deal about these boots all being steeped in Nike history, there’s no denying the connection when you see both boots sitting side by side. This boot is not nearly as bright as we expected, but we still think that it will be easy to spot once it begins to grace pitches worldwide. 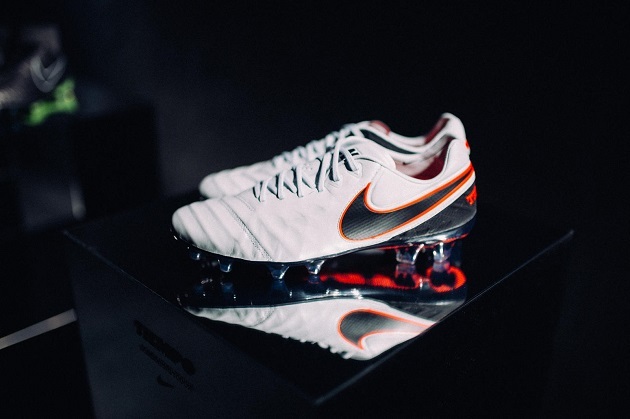 The last member of the “Liquid Chrome” Pack is the new Tiempo VI in the “Pure Platinum” colorway. While we are big fans of this colorway and cannot wait to get our hands on Nike’s newest toy, it really doesn’t seem to fit with the rest of the pack. We can definitely understand Nike not wanting the first colorway for their “heritage” boot to be as loud as the other members of the “Liquid Chrome” gathering, but it doesn’t really look right sitting with the other silos. We’ll forgive Nike this slight slip-up, but only if the Tiempo VI ends up being as good as we think that it might be.